Arsène Wenger has suffered yet another blow as he attempts to guideArsenal past Udinese and into the Champions League group phase, with the news that Jack Wilshere has been ruled out for at least three weeks because of recurring trouble with an ankle. The Arsenal manager has reluctantly sanctioned the £24m sale ofSamir Nasri to Manchester City and, with Cesc Fábregas already departed to Barcelona, his midfield options have been undermined ahead of the play-off second-leg tie here. 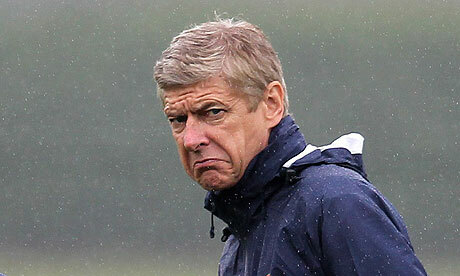 Arsenal are 1-0 up from the first leg. Wenger admitted the club “knew at the end of last season we could lose Nasri” and he lamented how the saga had “gone on for too long”. He smiled as he fielded questions about whether he feared the player had been tapped up but he did not make any accusations about City’s conduct. It was the Wilshere update, though, that reinforced the feeling that fate is conspiring against the manager. Wilshere first felt pain in his right ankle at the end of last season, when he played for England against Switzerland in the Euro 2012 qualifying tie at Wembley. Wenger had already raised concerns that the 19-year-old was “in the red” after his breakthrough season at senior level,meaning that he faced serious injury if he did not rest, and successfully withdrew him from the European Under-21 Championship in June. But Wilshere struggled in pre-season, failed to start the new season and despite removing a protective boot last week, returning to training and hoping at the weekend that he would travel to Italy, he suffered a relapse in training on Monday, which has seen the club take a preventative course. He has been ruled out of Sunday’s Premier League fixture at Manchester United, together with England’s upcoming ties against Bulgaria and Wales next month, and Wenger suggested that he had no firm idea of when he may return. The player has resumed wearing the protective boot. “He had a setback,” Wenger said. “It’s a hot spot on the bone of his ankle that if you continue to play can lead to a stress fracture. So we had to stop him. He felt the first sign in the second half of the [England] game against Switzerland [in June]. It was all right during the holidays and then his pain increased when we were on tour in Asia. He had two good tests on Friday and Saturday but he felt it again on Monday morning. Nasri trained with the Arsenal squad at London Colney in the morning before they flew to Italy but the decision had already been taken to omit him from the travelling party because to cup-tie him in the Champions League would have derailed the transfer to City. The deal was finally completed when a compromise was reached over the fees owed to the agents and lawyers involved. Nasri, who had entered the final 12 months of his Arsenal contract and would not sign another one at the club, travelled to Manchester on Tuesday afternoon to begin his City medical. “We did not want to lose [Cesc] Fábregas but we were forced into a situation we didn’t want while Nasri is a situation where the player didn’t want to extend his contract, with the proposals he had somewhere else,” Wenger said. “What kind of commitment can you have when the player is not there long term? That is the question you have to answer. Johan Djourou and Armand Traoré have passed fitness tests and they are expected to start and Tomas Rosicky has also travelled, although Wenger indicated that he may only be fit enough for the substitutes’ bench. Together with Wilshere and Nasri, Wenger will be without Laurent Koscielny, Kieran Gibbs, Sebastien Squillaci, Abou Diaby and Nicklas Bendtner. Arsenal arrived in Italy to discover that they had been fined £30,000 for failing to control their players at Newcastle United on the opening weekend of the Premier League season; Newcastle have also been found guilty and fined. Yet there was a small piece of overdue good news.